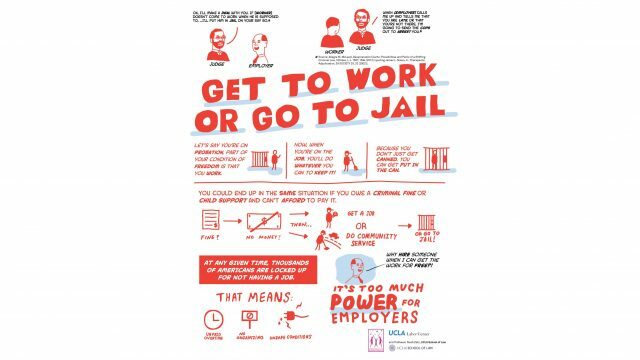 Get to work or go to jail; this happens most commonly when a person serves a sentence of probation or parole. Picture credit: Noah Zatz, UCLA Law, UCLA Labor Center, and A New Way of Life Re-entry Project. Warehouses are crucial nodes in the networks of goods movement that constitute today’s just-in-time supply chains and a large sector of LA’s economy anchored by the ports of LA and Long Beach. They also are important employers of low-wage workers of color who perform manual labor under difficult conditions. * Warehouses are well known for employing particularly vulnerable workers, including immigrant and formerly incarcerated workers, and for relying heavily on temporary staffing agencies to evade employment law obligations and suppress worker organizing. * This research project will explore an important but unstudied mechanism for creating and exploiting worker vulnerability to precarious work: the recruitment of workers who are under criminal justice supervision (probation, parole, and their variants) and thus under pressure to maintain employment or be (re)incarcerated. * Juliann Allison et al., Health Care Needs and Access Among Warehouse Workers in Southern California, UCLA IRLE Research & Policy Brief No. 35 (July 2015); Juliann Allison et al., Why the City of Ontario Needs to Raise the Minimum Wage: Earnings Among Warehouse Workers in Inland Southern California, UCLA IRLE Research & Policy Brief No. 36 (July 2015); Warehouse Workers United & Deogracia Cornelio, Shattered Dreams and Broken Bodies: A Brief Review of the Inland Empire Warehouse Industry, Warehouse Workers United & UCLA Labor Occupational Safety & Health Program (2011); Jamie Peck & Nik Theodore, Carceral Chicago: Making the Ex-offender Employability Crisis, 32 INTERNATIONAL JOURNAL OF URBAN AND REGIONAL RESEARCH251 (2008). * Juan D. De Lara et al., Organizing Temporary, Subcontracted, and Immigrant Workers. 41 LABOR STUDIES JOURNAL309 (2016).